Alter gravity and you can neutralise impact stress, eliminate pain, improve your movement control and reduce the energy cost of walking, running and jumping. 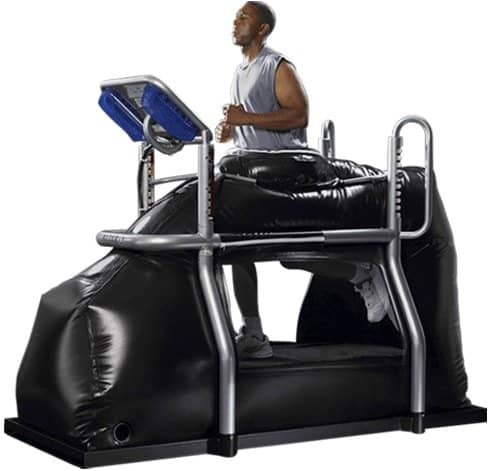 The anti-gravity treadmill – allows the user to reduce their bodyweight in 1%increments to as low as 20% of normal the equivalent of walking on the moon! Given that most of us can’t begin to imagine what that’s about we invite you to come along and experience it first hand with the guidance of one of our team. How can you make use of the Alter-G and “anti-gravity” technology at Balance Performance? You don’t have to be an existing client of ours. Come along on your own or with your physiotherapist, osteopath or other health professional or sports/fitness coach. You will need a 30 min induction. It’s very easy to use but there are features on this treadmill you need to understand and appreciate to get the full benefit from the Alter-G. It only takes 30 minutes with the guidance of one of the Alter-G team. After that you are good to go – unless you’d like additional coaching guidance of course. You can either pay-as-you-go for sessions from £17 for a 30 minute session; buy a package of 250 or 600 minutes to reduce costs even lower (from £10 per 30 minutes); or get goal specific programmes see them below and contact us about pricing. Goal Specific Programmes are available and created specifically for you by our team based around your specific aims or goals. Depending on the programme you’ll see either a physiotherapist or strength and conditioning coach for your induction – if you haven’t had one already – and then they’ll create a programme, take you through the components and then review your progress several weeks later. How can it help me specifically? – the impact of running causes pain to injured feet, ankles, knees and hips. Hitting the bodyweight % button on the Alter-G reduces it incremently to a point where you can begin running again pain free and then systematically progress back to the road, track, field, trail, court or gym. – the impact of the foot striking the ground reverberates through the legs and into the back during walking, running and jumping: for many back pain sufferers the consequences of this are painful. Whether the pain is a long term and ongoing aggravation or from a recently sustained injury, Alter-G provides an opportunity to relieve pain and rediscover normal movement. – particularly after orthopaedic procedures, people are often left with a long road ahead of them before they can move with ease and confidence. Whether low back disc surgery or an ACL knee ligament repair the Alter-G enables clients to step out of a protective boot or put the crutches to one side and give partial but positive weight bearing and impact to stimulate healing and increase confidence. – everything comes at a cost. When you train with high volume, particularly in activities like running and triathlon, the impact on the joints and strain on the muscles and tendons accumulates. Alter-G allows runners to expand or maintain their mileage significantly with far less physical stress. Long runs and brick sessions take on new meaning and offer fresh opportunites with the Alter-G.
– Reduce impact. Excercise more. Lose Weight. When you are determined to reduce bodyweight to healthier levels it is a massive challenge to be able to achieve the necessary amount of time walking and eventually running to support the dietary changes you made. The Alter-G can not only demonstrate what it feels like to move at your target weight – bodyweight can be reduced to as low as 20% of normal – but also allows extended periods of sustained activity with less joint stress.